Take a good look at your hands and wrists. Do you see lots of bluish lines that look like a maze under your skin? Those lines are veins that are sending your blood through your body. Most of us don’t think about our blood very often, unless we get cut and see it oozing out. But blood is one of the most amazing substances in the world. Let’s see why blood is so great. Your body is composed of cells that do all kinds of different jobs. Your brain cells help you think, your skin cells protect your body, bone cells give your body support, and hundreds of other kinds of cells work hard to keep you healthy. But all of these cells need energy. And many of the cells make “garbage” or waste products that need to be carried away. How does your body supply all of its cells with what they need? That is where blood fits in. The veins and arteries in your body are tiny tubes that God designed to transport blood. They are like pipes in your house that send water to your faucets. Except you have a lot more blood vessels than your house has pipes. 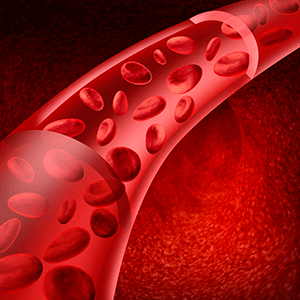 In fact, you have over 50,000 miles of blood vessels in your body. The blood that goes through those vessels is extremely important. It makes up about 8% of your total body weight. You have about 1.3 gallons of blood, or 5.3 quarts. Your blood is made up of two main parts. One part is made up of cells: mostly red blood cells, white blood cells, and platelets. Jeff Miller has written an article in this month’s Discovery that discusses God’s amazing design that we see in platelets and blood clotting. Blood cells make up about 45% of your blood. The other 55% of blood is called plasma. Plasma is mostly water (about 90%), but it does contain other things like salt, protein, and sugars. God designed blood to be the perfect substance to carry things to and from the cells in your body. For instance, your cells need oxygen. When you breathe, you take oxygen into your lungs. But the cells in your toes need oxygen just as badly as the cells in your lungs. How does the oxygen from your lungs get to your toes? Your blood has special cells called red blood cells that are perfectly designed to pick up oxygen. These cells are “built” inside your bones in bone marrow. They are then put into your blood from the bone marrow and start carrying oxygen from your lungs to the other cells in your body. But oxygen is not the only thing that your cells need. They also need energy to do their work. They get this energy from food that you eat. The food goes into your stomach where it is digested. But the skin cells in your fingers need energy just as badly as the cells in your stomach. How do the cells in your fingertips get the fuel they need from the food in the stomach? That’s right, blood carries the vitamins, sugars, proteins, and other things cells need from your stomach to the places in the body that need them. As the cells in your body burn fuel and use oxygen, they make waste or “garbage.” This is similar to how we might eat cereal out of a box and need to throw away the cardboard box when we are done. One of the main waste products that your cells produce is called carbon dioxide. Cells all over your body produce carbon dioxide. So how do they get rid of this “garbage”? They dump it into your blood. You might think, "Yuck! My blood is full of garbage!" But don’t worry. Your blood takes the carbon dioxide and sends it back into your lungs. When you breathe out, you are getting rid of the “garbage gas” carbon dioxide that your body does not need. It is interesting to know that God designed plants to use this gas for fuel like we use oxygen. And the plants send out a “garbage gas” that they don’t use, which is oxygen. God has thought of everything that humans need to live healthy, productive lives. Also, your blood carries white blood cells that are like soldiers that attack infection. Wherever your body senses an “alien” substance, white blood cells ride along through your blood and get to the place where they are needed. The study of blood is called hematology. We could spend countless hours trying to learn all about the wonderful qualities of blood. The blood is so well-designed that we can learn from it that the idea that blood evolved over millions of years by time and chance does not make any sense. Only a very intelligent Designer could create such a useful substance. We should thank God for our wonderful blood—and hope we don’t see ours outside of our body very often!